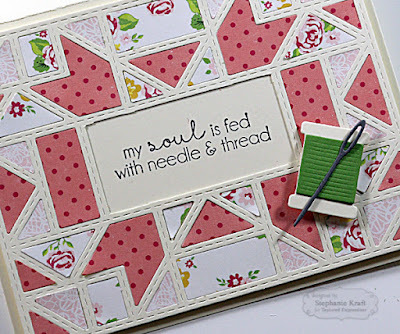 HandKrafted by Stephanie: TE April Sneak Peeks: Bookmarks & Quilted Cards! 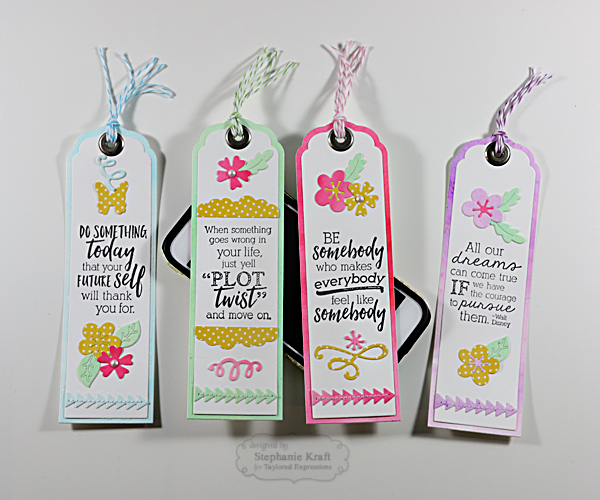 TE April Sneak Peeks: Bookmarks & Quilted Cards! 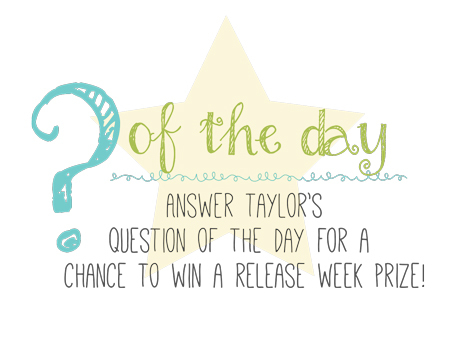 Hello and welcome to the first day of Taylored Expressions April Sneak Peeks! The Creative Team is kicking off 4 days of projects (3 days of peeks and release day). All products will be released on Thursday, April 7 @ 7 AM PDT. My first project is a set of bookmarks. 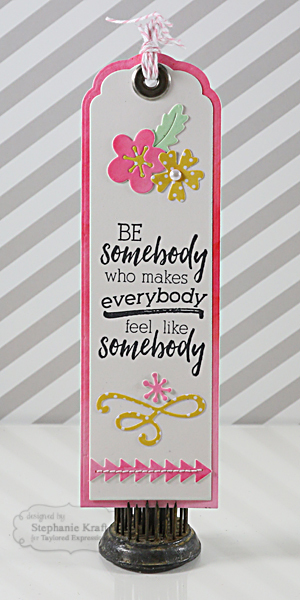 They make such great gifts, and with Teacher Appreciation Week and the end of school quickly approaching, I decided to get a head start on these. 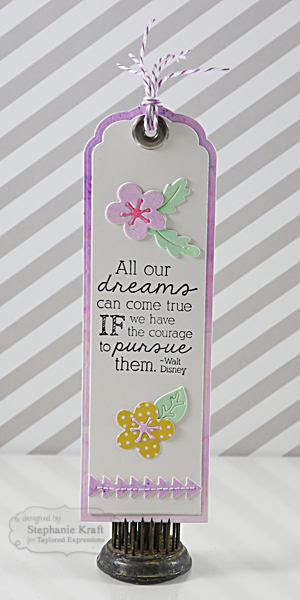 I used the new Build a Bookmark dies. 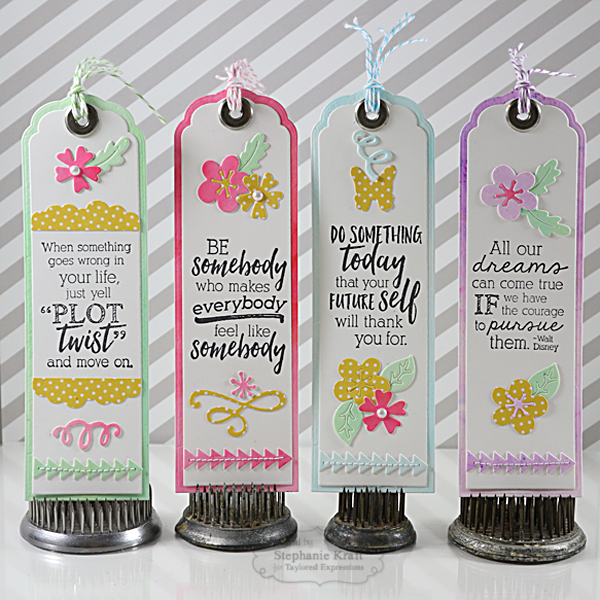 They coordinate with the previously released Mark Your Spot Bookmark die. The set includes a larger piece so that you can mat your bookmark for more stability (and in my case, hide stitching done on the top layer). 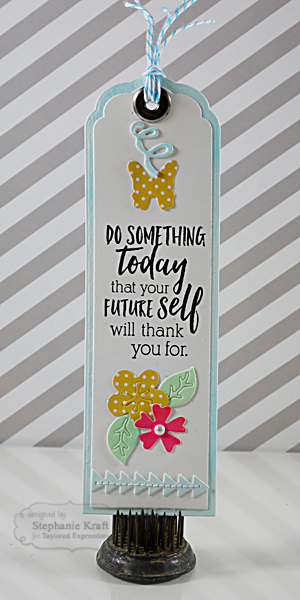 And in true "Build a..." fashion, it includes smaller elements to embellish your bookmarks. 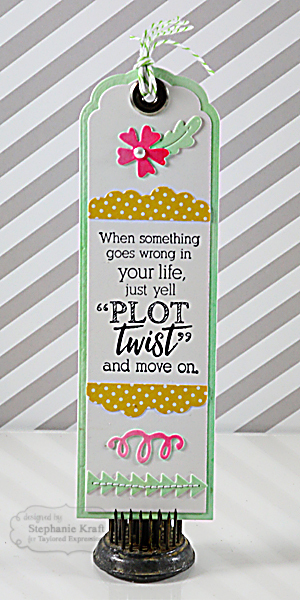 All of the quotes/sentiments are from Plot Twist. I tried not to add much bulk, however, I did add a few flat back pearls to the centers of a few of the flowers. I also added an eyelet and some Divine Twine to the top of each bookmark. And finally, here's a photo of all of my bookmarks along with my iPhone. I do the majority of my reading on my phone, so I wouldn't actually use these bookmarks myself. I know that many people still like to read physical books, but I'm hooked on technology! 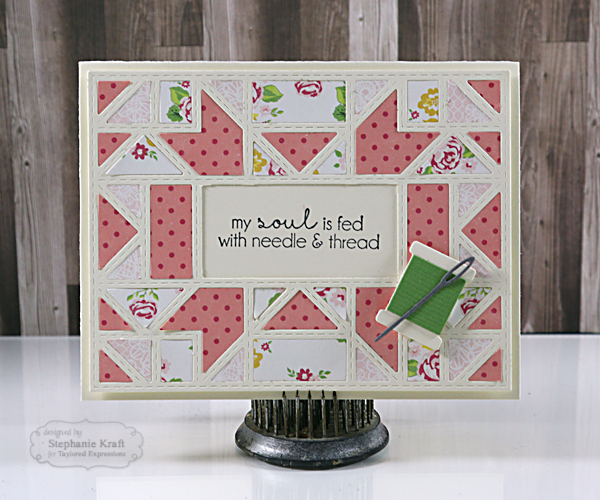 Next I have a couple of cards using one of my favorite new products, the Quilted Cutting Plate! I have just gotten into quilting within the past couple of years, so I love that I can make a quilted card. Just look at all of the stitching! 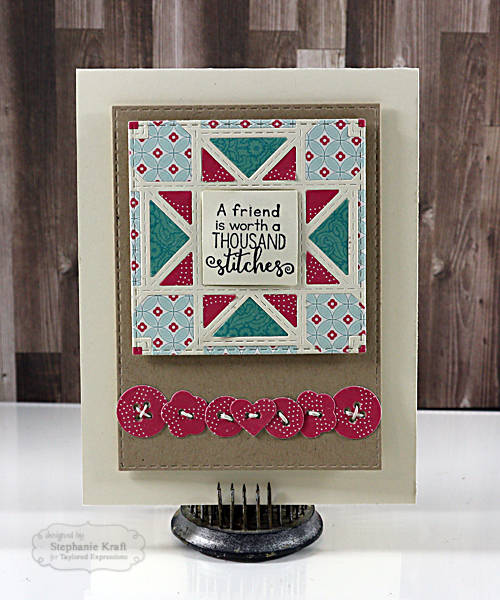 This card features the entire cutting plate, which I die cut out of Buttercream Frosting cardstock, then again out of 3 different patterned papers. I pieced everything together like I would an actual quilt. I did trim part of the center out so that I could fit my sentiment, which is from Stitch by Stitch 2. My embellishment is the new Little Bits - Needle & Thread. 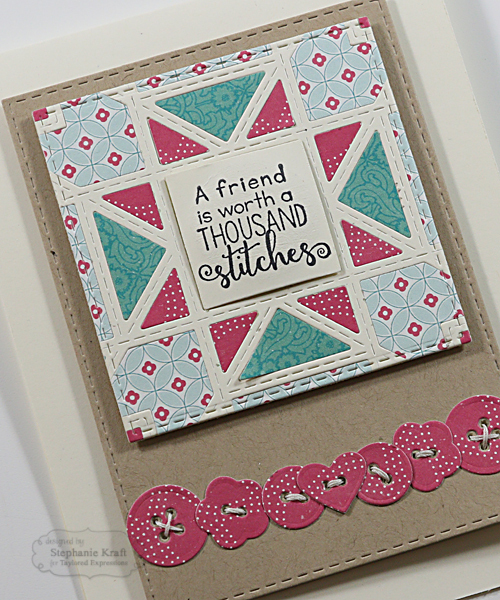 My final card also uses the Quilted Cutting Plate, though I trimmed it down to use only a portion of it. Once again, I pieced together my quilt. The sentiment is from A Thousand Stitches. The row of buttons uses Little Bits - Buttons (a set that includes 4 different sizes and shapes of buttons). Stephanie, these are ALL fantastic! You ladies have rocked this release! I can't imagine anyone making anything better than what I saw here today but as you all proved that theory wrong....I can't wait to see what more is to come!